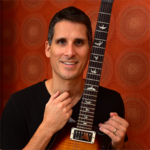 In this free video guitar lesson, you learn how to play a few verses and choruses to the song “Cliffs of Dover” by Eric Johnson. This advanced level guitar lesson includes use of pentatonic scales, major sales, CAGED chord forms and arpeggio patterns, hammer-ons, pull-offs, slides, bends, alternate picking, sweep picking, and hybrid picking. 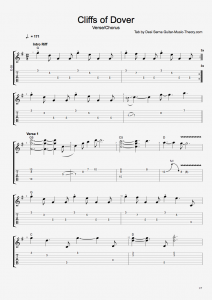 Follow along with free Cliffs of Dover guitar tab by choosing from the options below. Top shelf job here. YOU RAWK!! Hi, I stumbled across your instructions recently on a business trip to Korea and had time on my hands at the hotel. Oh and I travel with a guitar. As other comments I read, Im 55 and played most of my life. This is a difficult song but you have opened the doors for me to at least fake it. Thank you for offering this to allow guys like me to have fun trying.